"Haha! You mean Zombies? Like George Romero?" Recently released from Intervision Pictures Corp./Severin Films is a film that I was initially hesitant about watching. Why, you ask? Well I am a lover of Italian horror cinema, but my knowledge of anything post 1980's is very limited. Plus, Bruno Mattei's film career is definitely spotty and though I've grown to love many of his films, I just wasn't sure what to expect here. But I really am thankful that I took the plunge. 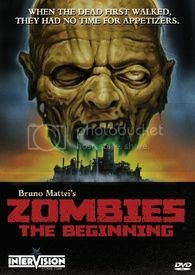 Zombies: The Beginning (with its ripoff of Fulci's Gates of Hell cover art) begins with a traumatized woman found afloat in the water. The woman suffers from nightmares about the living dead, which she claims to have killed her colleagues and is then fired from her job due to these crazy stories. She then becomes a Buddhist (?) but is brought back to the island by the Tyler Corporation, who have a sneaking suspicion that a "sample" (aka Zombie) that they sent there has...um...caused some problems. The girl travels with a group of soldiers to the island to see the prognosis. Just a hint...it's not good. Ok so what I may have missed from my fuzzy, incoherent synopsis (for this fuzzy, incoherent film) is that this film is basically Aliens, with zombies instead of Aliens. Ok, not basically. It IS Aliens. The funny thing is that Bruno Mattei (billed here under his usual moniker Vincent Dawn) already did an Alien ripoff in 1989 called Shocking Dark. But that one included elements of The Terminator, instead of zombies so it's ok. So basically, this film is a ripoff of a ripoff. Not something completely unheard of for a Mattei film, nor is the "borrowed" footage (yes, you can see Viggo Mortensen for a couple seconds thanks to some Crimson Tide footage), horrible dubbing and script ("You Ugly Witch"). But you know what? I actually really enjoyed this film. Like I stated before, I was initially concerned by the time when this film was made, but luckily (at least in Mattei World), not much has changed in 25 or so years! Replace some terrible CGI with terrible models and BAM! It's the 80's all over again! So what did I like about this film? The makeup FX were surprisingly well done. The story was engaging (despite its unoriginality) and there were plenty of laugh out loud moments to keep you watching. So in closing, don't expect a great film (or an original one) but do expect a breezy, cheezy splatter-ific gas! There wasn't much improvement needed to be done by Intervision for this release, seeing how it is a fairly recent film so the picture quality is fine and there is also a trailer and a nice little featurette with the writer and his relationship with Mattei.